Tips and tricks for people with adult dyslexia is a comprehensive guide covering the basics of dyslexia to a wide range of diagnostic procedures and tips to help you manage with your symptoms. 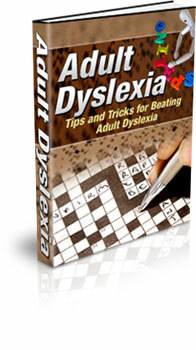 These tips and tricks have been used on people with dyslexia of every varying degree and with great success. People just like yourself that suffer with adult dyslexia now feel more comfortable and relaxed in social and work situations. It's a system that works well for everyone else so why not let it work for you?